I pray for all those impacted by the tragedy. I pray for who we injured in the incident. God please bring them healing. I pray for the employees at the theatre who have witnessed things that will change their life. God please give them peace. I pray the police officers and other first responders who swiftly reacted to the situation. Father give them the wisdom to continue the process so justice may prevail. I pray for the victims, and the community. Holy Spirit bring healing and unity. Lord I pray for the families who tragically suffered a loss. God be near, hear their crying, sense their pain. Lord be their constant. Be their Rock. Deliver them from this dark desperate time. It’s times like these that we are reminded to find our comfort in the Lord. 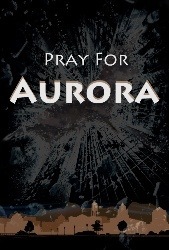 Lets continue to lift up those in Aurora in prayer. It’s not only tragic for them, but for our nation. Let’s draw together as a country. Let’s draw together as a community of believers to support them. I still plan to see the movie. I also need to see my friends who still work at Grand Cinema.